These chic Velas look like something the hipsters here in Portland, OR would be wearing around town. This is supposed to be a compliment. (Don't hate the hipsters.) 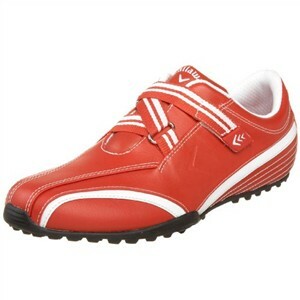 This is a spikeless golf shoe designed for comfort and style probably more than performance on the golf course. The shoe is lightweight, made of a full leather outsole with a comfy soft cushioned insole. Instead of laces, you get a hook-and-loop adjustable Velcro strap. They come in three colors: white, black and red. I'd recommend these golf shoes for you stylish ladies that are looking to turn more heads with your outfit then with your long drive. The nubs on the bottom are not as good for gripping as soft spikes. However, the upside is you can wear them in the club restaurant after the round. Also be forewarned that the metal loops that the Velcro straps feed through tend to shift as you walk, loosening the fit. You may find yourself having to re-adjust frequently, like an MLB batter tightening his batting gloves before every pitch. If you want a shoe with more emphasis on performance, have a look-see at the Adidas Tour Metal Women's Golf Shoes. And for a nice combo ‘tween style, comfort, and performance, I recommend the ECCO Women's Comfort Swing Premiere Golf Shoe.